The weights gym floor being levelled in stages. We are very close to being able to use our exciting new gym. The entrance courtyard has been re-laid and this area looks very good indeed. Inside, almost all the work has been completed and we hope the specialist gym floors will be fitted within the next two weeks. As soon as we have practical completion and the specialist floors are down the gyms will be opened for use. The showers and changing room can be used now. There are some teething issues and items to be completed which will be sorted out in due course. A Durham rower tweeting at the HORR pronounced them ‘the best showers ever’. The old changing room benches have been sanded by the Irregulars and are being refurbished for re-use. The locker design is being sorted out currently and we hope the steel bridge link will go in next week. The Club is thankful to members for making do without facilities during the redevelopment. The area around the gym is being landscaped. The door from Spring Passage to the back of the gym is being renewed and will give access to an area where bicycles may be locked. This will allow the entrance area and all areas inside the Club to be kept free of bicycles. The gym equipment will be ordered in two phases, funds permitting, and we hope to have ordered the first phase by the time this update is published. There is a lead in time which means we will have to wait until equipment starts appearing and members will be kept updated. Further fitting out work will develop progressively as we use the new facility. Our new gym will be something all members can be very proud of and we hope all users will look after it. The Club will introduce a code of conduct to ensure that our use of the gym respects other gym users and our neighbours. The gym sub-committee will remain active until the project and issues related to it are complete and it is intended this will include refurbishing the current Crew Room to provide a club room for members. As the changing room and gyms come into use, the sub-committee would be grateful for any comments you have. Please send these to peter.halford@gmail.com. For more information, please contact Peter Halford, Eddie Markes or Simon Harris. The weekend of the Head of the River Race and Veterans’ Head of the River Race saw the new men’s changing room used for the first time. As yet lacking benches and lockers, it remained a bare room but the facilities were functioning. Anyone who used to use the old showers will remember the fine spray they emitted - more useful to an orchid display than for washing oarsmen who had just come off the river. The new showers, which have four bars of pressure, are the antithesis of the old and most welcome. They are a taste of things pending. Having said that, despite the generosity of the membership in this last push, we have not yet crossed the finishing line. Now is your last opportunity to make a donation and for your name to be included on the list of donors which will be on permanent display. The present membership and future generations will always be hugely grateful for your contribution and remember your generosity. If, therefore, you would like to make a donation to get us over the line, please will you do so without further delay. To do this, please either send a cheque to me at the Club or make a telegraphic transfer into the Club’s account numbered 00784222, sort code 60-00-01. Please reference your payment ‘gym’ followed by your name. Thank you again to everyone who has already contributed and thank you to those who do so over the course of the next few weeks. The Official Opening of the new Gym has been set for 7th June. More information about this will be included in the next edition of The London Roar but, for now, please put the date in your diary. Members are invited to join family and friends for the naming of the new Empacher coxless 4 after John Cooney on Saturday 13 April at 3.00pm. Tea and cake will be offered in the Long Room, with other beverages available. John died on 21 March 2018 aged 54 after a long struggle with lymphoma. He was part of the successful heavy and lightweight squads at LRC in the 1990s, finishing 6th for LRC 1 at the 1992 Head. He was selected for the first Head eight the following year but was disappointed to pull out on the morning with illness. He rowed in the 1994 lightweight London crew that represented England in the Commonwealth Regatta in London Ontario, winning gold ahead of Australia (silver) and Canada (bronze). Earlier that year the same crew won open and lightweight eights at the National Championships at Nottingham, their time of 5.43 the lightweight record for the event to date. John loved rowing and LRC was especially close to his heart. A party animal, he made a big impression on all who knew him. He contributed hugely to the Club with his humour and larger-than-life personality. His interests extended well beyond rowing – he was a self-taught guitarist, elite level cyclist, filmmaker, keen motorcyclist and car enthusiast. He threw himself into life with gusto and an infectious enthusiasm. He would be absolutely thrilled to know that an LRC boat bears his name. Members are invited to join a celebration of London's longest serving volunteer coach of the modern era, Richard Philips. We will name an eight for Richard who has been a member of the Club since 1973. 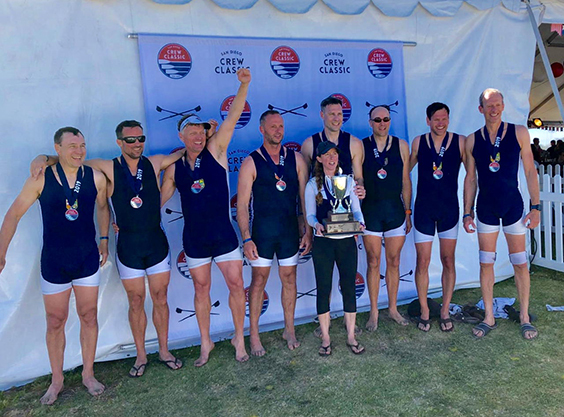 LRC’s Racing Masters’ followed their 10th place overall in the Veterans Head by flying to San Diego to compete in the Crew Classic, a 2,000m eight lane regatta in San Diego’s Mission Bay, where they raced top US Masters’ crews in two events. Masters Club Championships crew, left to right: Stewart Harries, Duncan McLellan, Ralph Humphrey, Shaun Martin, Henry Hering, Adrian Theed, Marc Schneider, Peter Jacobs and Anna Liberovsky. Masters D event prize-giving, left to right: Stewart Harries, Duncan McLellan, Ralph Humphrey, Shaun Martin, Henry Hering, Adrian Theed, Marc Schneider and Peter Jacobs, with Mary Whipple at the front holding the trophy. On arriving it was confirmed to everyone’s delight that Mary Whipple, Olympic champion with the US women’s eight at London and Rio and silver medallist in Beijing, would share LRC’s coxing duties over the weekend. In the premier Masters’ Club Championship, LRC were given a tough lane draw and rowed well to finish first across the line, but were narrowly second on handicap to Cambridge BC (USA) in both heat and final. Their third and last race of the weekend was the Masters D final, with the main opposition coming from current US champions Texas Rowing Centre. As in each other race, LRC moved away from the field from the first stroke and settled into a strong, lively rhythm to open up clear water on the rest of the field by the finish line. But with no handicap applied in this last race, crossing the finish line first was all that was needed. The crew made many friends in San Diego and some LRC members will remember Ian Simpson (photo below) who was attending and sends his regards to all. Thanks go to Long Beach Rowing Association for providing equipment and especially to the amazing Helen Frykman. Youtube coverage of Sunday’s races can be seen at https://www.youtube.com/watch?v=sP1iUcvuDYI (4:27:30 Masters’ Club Championship final and 8:09:47 Masters’ D final). Left to right: Miles Preston (Coach), Ollie Moore (Cox), Dugald Moore (4 - father of Ollie), Brendan Armstrong (3), Ben Phillips (7), Nicolas Wykeman (2), Whit Mason (5), Tom Blackett (Bow), Rory O'Sullivan (Stroke) and Hugh Lonsdale (6). 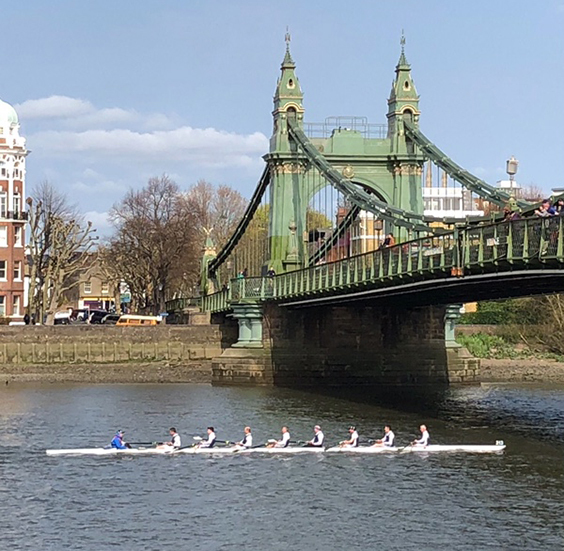 This month’s news has been dominated by the winning of a pennant by an Irregulars crew at the recent Vets Eights Head - a novice pennant but a pennant none the less! The crew consisted of at least three oarsmen who had very little sweep experience and had certainly never raced in a sweep boat. It was a very admirable effort - they had been excellently coached by Miles Preston whose emphasis at the pre-race briefing was to enjoy it but concentrate on ‘thinking together’. This they duly did, overtaking three crews in the process, and as a consequence winning their category of six crews by a good margin. Taking delivery of the pennant and pots! Special mention must be made of their excellent cox, Ollie Moore, who exuded enthusiasm and confidence and took no prisoners (especially the no. 4 man - his father! ) when exhorting the crew to keep going and row as a unit. It made a huge difference. Well done to Rory, Ben, Hugh, Whit, Dugald, Brendan, Nick and Tom and, of course, Ollie. First, six Irregulars (Phil C, Diana, Al, Frank, Ian C and Brendan) fulfilled duties at the Eights Head - and thoroughly enjoyed the experience of assisting in the running of such an extremely well run event. Members of MK's family stand in front of the photo following its unveiling. Secondly, three Irregulars and our President made up an eight with four members of MK Morris’s family on Friday, 05 April (see last edition of TLR) before attending a picture unveiling in the Long Room and an informal lunch. Thanks, and well done to all of you. This group was formed in 2016 to expand our recreational rowing groups. The first members, a few who have progressed their rowing to qualified steers level, were graduates from our extensive Learn to Row Programme. The group soon welcomed many who had rowed at University or School. The Young Irregulars are currently about 20 strong and welcome new members. If you are not a member of the group but are interested in getting involved or you know someone who might like to join the group, please get in touch with me or encourage them to do so. Many of the Young Irregulars have gratefully benefitted from volunteer coaches. If you would like to join us or you are a qualified member and would be willing to coach a session now and again, please contact me on kathleen.curran@londonrc.org.uk. The group typically goes out at midday on Saturdays (but is open to earlier outings if this suits coaches) and would welcome weekday evening sessions in the spring and summer. LRC is proud of this group and looks forward to watching it grow. One of its members, Edward Cole, will be sculling in Hammersmith Regatta on 27 April. We wish him success! Starting on Easter Sunday, 21 April, the Club will be offering Sunday Roast to members and their families and guests. With one exception (12 May), these will happen every Sunday up to and including Father’s Day on the 16 June. Please join us from Midday to 3:00pm starting on Easter Sunday. The menu will be a nod to the bounty of the British Isles, with grass-fed Spring Salt Lamb as the highlight. Please help keep the Club tidy by picking up after you, especially in the Crew Room and other common areas. Please remember to use the Rower’s Entrance when coming off the water, removing wellies at the door. Annie Vernon has agreed to speak about her book, “Mind Games” (which was released on the 21 March) at the Club on Tuesday, the 28 May. More details to follow… but please reserve the date now. Several weeks ago, when Will and I sat down with Shane Dorsett to discuss the Eights Head party, we had hopes that we could prove that London was back to compete in every sense of the word. We looked back at the last few Eights and Fours Head parties and set out with a target of attracting an attendance of 70 people – and if I am honest we wanted to replicate the stories we had been told around the Club of parties gone by (don’t worry your secrets are safe with us). When Shane and Tim encouraged us with the mantra ‘build it and they will come’, Will and I were more than a little doubting of our ability to gain enough interest to cover the cost of what we had in mind. Rodeo bulls booked, DJs organised, beer pong set up and 150 inflated balloons later, I’m glad to say we were proved very wrong. Over 260 people attend the Eights Head Party, including crews from Durham, Zurich, Vesta, Thames, Cork and many more - and believe me, a mechanical rodeo bull in the long room was definitely a sight to behold! The last few numbers are being confirmed on what was raised for the Club but we took in excess of £7,000 on the night. This is testament to the work the senior squad put in to promoting and helping us on the day, to Tommy and all the bar staff on the night and to Shane and Tim for pushing us to ‘grab the bull by the horns’. We can’t say thank you enough! Rob in the boat after winning a bronze medal at the European Championships in 1955. Such gentlemanly behaviour as they congratulate each other after a hard race. For those of you who may be interested to know, immediately following the Head of the River Race, Rob van Mesdag’s sculling boat, which was seen by so many members over the years gliding smoothly past the Club ably sculled by the master himself, set off on its journey to Trinity College Dublin where it will now be, no doubt, very carefully looked after as a memorial to Rob who was their boat club’s president for many years.